Stone hand axe from the Olduvai Gorge, Tanzania. This hand axe was found in 1931 by Louis Leakey in the Olduvai Gorge in Tanzania, and is dated to about 1.2 million years ago. It was made from a block of hard, green lava called phonolite by chipping at the edges with a round pebble. Flakes were chipped off to create a two bladed tool with sharp, serrated cutting edges. Dimensions: 238mm long x 100mm wide x 50mm deep. This type of tool-making began about 1.6 million years ago with Homo erectus and was knowledge that was passed onto Humans and Neanderthals. Small hand tools became common for cutting meat or woodworking. These tools were produced with great skill by hominoids that were the ancestors to modern humans. These ancient tools display that manufactured objects are important in the evolution of our behaviour and the migration of technology, ideas and culture. This migration of technology, ideas and culture is an important feature of our species and is integral to our adaptability and migration to every corner of the planet. 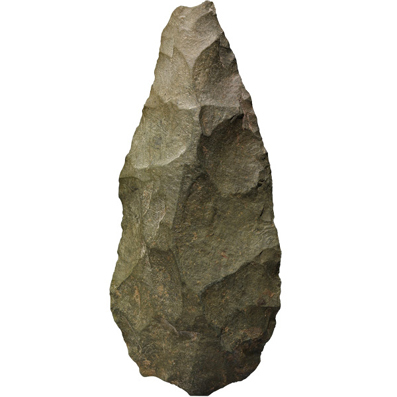 This hand axe interprets the first great migration of humans and the establishment of a culture that displays of our universal human characteristics. The Aboriginal migration to Australia was the earliest large scale migration in human history. The first Aboriginal people who arrived on the north west coast of Australia 60,000 years relied on these tools to eke out a living as they spread across the continent. During the last Ice Age, Australia was much colder and wetter. Much of the inland was temperate or sub tropical with vast rivers and lakes. Lake Mungo in south west New South Wales, now a dry plain, was a wetland teeming with birds, fish and animals including the now extinct mega fauna. At Lake Mungo archaeologists have discovered stone tools at the same levels in the soil as fossilised mega fauna.